Xtra, Canada’s Gay & Lesbian News, had a recent article written by Michael Luongo on Rio de Janeiro. Read all about it…. To my mind, there is no more beautifully situated city in the world than Rio de Janeiro. A beachside metropolis, my favorite kind of urban destination, it spreads up from the Atlantic Ocean into the dramatic mountains behind it. Many are oddly rounded in shape, like Sugarloaf (which takes its name from a time when sugar was shaped in cones) and Corcovado (“hunchback” in Portuguese), graced for more than 80 years by the outstretched arms of Christ the Redeemer, who blesses the city and her residents no matter what sins they get up to. On Botafogo Bay looking toward Sugarloaf Mountain. Rio de Janeiro from the Corcovado. Young men celebrating during a Carnival street parade in Copacabana. Madame Satã is just one example of Rio’s gay history and her always-lurking dangers. The city has dramatically improved in the past decade in both cleanliness and safety, as all of Brazil’s economy has uplifted and with the city preparing for the Olympics. Still, night is a time to be cautious. I was once attacked by young kids with knives in Copacabana. In the end, I was relatively unharmed, just a little shaken, but I was left with one of my favorite Rio stories. I flagged down the police, explaining to them what had happened, but we could not find the suspects when we did a drive-around. The police asked me where I was heading, which was to a new gay bar (since closed.) 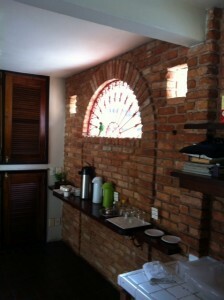 The policemen did not know of it but said they would instead take me to Le Boy, Rio’s best-known gay club. They turned on the sirens and the flashing lights and sped me through the streets. In front of Le Boy, I hugged and kissed the policemen goodbye and stepped out of the patrol car into the club, skipping the long line, with everyone thinking I was a celebrity or a gay cop. Men on the beach playing volleyball in Rio de Janeiro. We had some parakeets, four to be exact, fly into our kitchen and visit us for breakfast! Below is a photo of one of the parakeets just above the beverage area. Fortunately, no messes were created and the guests were delighted!!! Clowns Protest Santa Teresa Bonde Plan; Want it returned NOW! 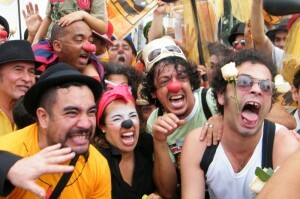 RIO DE JANEIRO, BRAZIL – Dozens of comic artists yesterday donned red noses and baggy pants to stage a good-natured protest at the Arcos da Lapa, demanding the return of the traditional bonde (tram) in Santa Teresa after the system was suspended indefinitely following a fatal derailment earlier this year. Clowns protesting at Rio’s Arcos da Lapa demanded the Santa Teresa bonde be returned to its former glory, photo by Vladimir Platonow/ABr. “Santa Teresa without the tram is not Santa Teresa. The tram is about simplicity in the face of a more technological world and this is a symbol of poetry, as are clowns,” explained 60-year-old professional clown Leo Bassi. IGLTA Annual Global Convention 2012…in FLORIPA, Brazil!!!! The city of Rio de Janeiro has marked World AIDS day by lighting 10 of its famous monuments and attractions in red including The Christ Redeemer Statue. The red lights will be on for 3 nights in Rio. Rio’s government has also invested $1.1 million in a program, the largest city-wide campaign in Brazil to combat ignorance, prejudices and misinformation about AIDS.